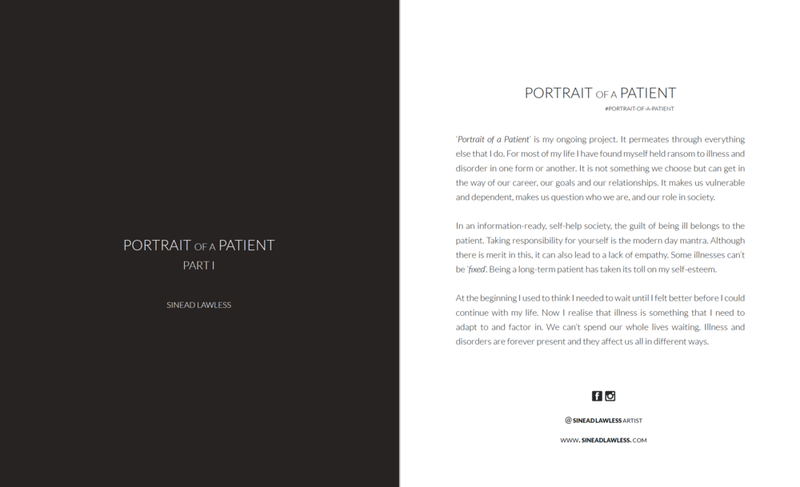 A collection of words and visuals pertaining to my personal experience with illness. Awarded the 2018 Provost Fund for The Visual and Performing Arts by Trinity College Dublin. The pieces will be exhibited in the Trinity Health Sciences building (James’ Hospital campus, Dublin) from September 2018 - September 2019. The world makes more sense to me when I create. I create for my health. I was diagnosed with Ulcerative Colitis* in 2006. What followed was 10+ years of pain, anxiety, depression, hospitalisation, medication, surgery, and almost death. What also followed was awakening, awareness, gratitude and survival. In 2015, after 14+ years of working in graphic design; illness and frequent hospitalisation forced me to take time out. As I lay in hospital or at home in bed I would often open my phone to write down how I was feeling. The words would flow out, sometimes rhyming, sometimes not, but I would always feel better afterwards. I would rarely revisit these notes or try to perfect them once the moment had passed. After another major surgery in 2016 my health improved dramatically and I opened up my collection of notes/words/poems and curated them to best represent my cyclical journey of illness and health, and work on a visual representation. The artist, Sinead Lawless, is a young woman who has had to redefine her life as a result of a chronic illness, Ulcerative Colitis. This is a chronic inflammatory bowel disease. During the course of her disease, she has kept drawing and writing to illustrate and reflect how the disease has impacted on her, both physically and mentally. Cillin Condon, TCD, approached Sinead to apply for funding to support her to paint four of these images on canvas to be hung in the common areas of the Trinity Centre for Health Sciences. The genesis for this is teaching young adults who may not have experience chronic pain or suffering and so as they gain knowledge about disease prior to clinical training may not be able fully empathise with the patient experience. The images will be near common areas used by all healthcare students and staff. Members of the public also access these common areas. * The term inflammatory bowel disease (IBD) covers a group of disorders (Crohn’s and Colitis) in which the intestines become inflamed, as a result of an immune reaction of the body against its own intestinal tissue. Inflammatory bowel disease can result in permanent damage to the intestines, intestinal bleeding, rectal bleeding, ulcers, or serious complications. There are many treatments available to help patients to manage their condition but currently no cure. It can also affect many other systems of the body.